Neptune began his life as Gale, where he grew up in a small coastal town on the shores of Calandros, where he spent most of his time in the water. 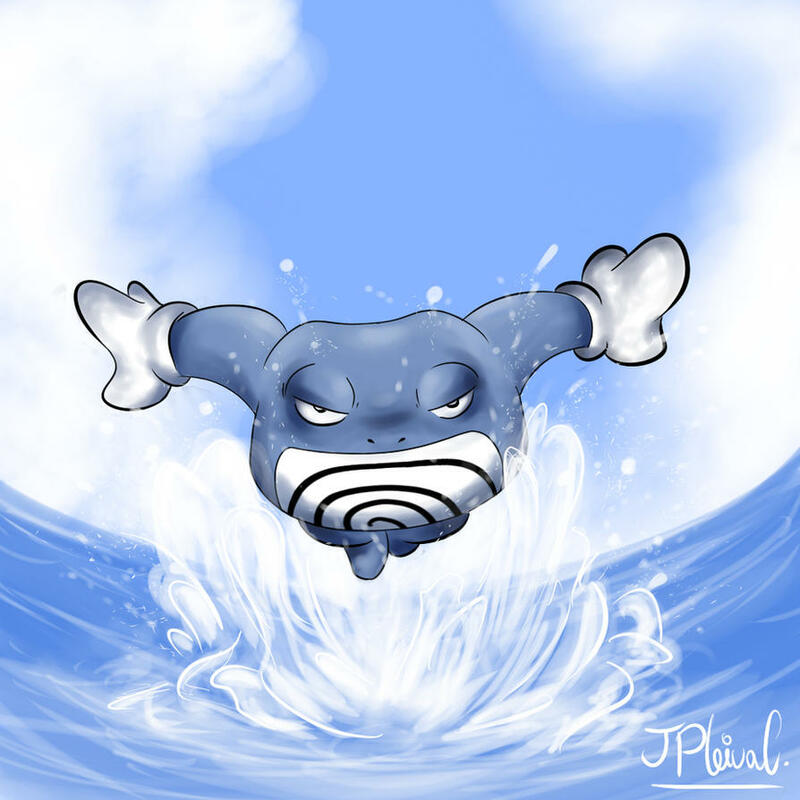 He quickly learned how to swim, and, with his poliwag partner, he became the best swimmer in the town, winning the annual competitions without any difficulties. As he grew older, he continued his active lifestyle, collecting a great deal of water type pokemon from his journeys further and further into the ocean. Coming from a small, conservative hamlet with a large deal of patriotic spirit and support for the league, Gale knew from an early age that he was destined to join the military to fight against the rebels across the sea. When he came of age, Gale chose to enter the Navy, a natural choice for him given his habits as a child. The lifestyle of a Navy Private was hard, but it was an environment that Gale excelled in. He quickly gained a reputation for his affinity for the ocean (an affinity that surprisingly few of the Caldros Navy possessed), and his friends began calling him Neptune for his ability to stay underwater for record amounts of time. As athletic as one could be, the newly dubbed Neptune also took easily to the combat training that every naval cadet went through. His ability to attack was only average, but he was tough and difficult to take down. Additionally, he began to learn the tricks of grappling and wrestling, devoting more and more of his training time to the fighting style. Neptune took this new fighting style to his first battle, where they boarded a Shalmos ship and tried to obtain the ship. In the heat of the battle, Neptune and several enemy soldiers were blown into the water from a large explosion. Neptune prevented three of the sailors from climbing aboard by grappling them in the water and dragging them under the surface of the waves, drowning them. Somehow, Neptune didn't drown himself that day, instead gaining an uncanny ability to breath water like so many of his pokemon. Neptune attributed this gift, as with many of his other gifts, to Manaphy, and his devotion to the sea deity redoubled. From that day forward, Neptune honed his unique fighting style of throwing opponents overboard and drowning them as they struggled for breath. Some thought this unnecessarily cruel, but Neptune found it a fitting fate for the rebels who had tried to overthrow the league. Neptune's reputation caused him to quickly rise up the ranks in the Navy. However, he simply didn't have the disposition to be a commander. In battle he preferred to leap into the fray, not command calmly from the deck of a ship. Instead, he stayed as the highest rank that a warrior could hold and still participate in active combat. Eventually however, he began to tire of the endless battles and endless losses that the Calondros Navy seemed to always suffer. Whether it was the training regimes, the tacticians' inadequacy, or continued bad luck, the Shalmos navy always seemed to end up on top, no matter how many enemies he killed. Neptune began to search for other options to contribute to the League's cause, and he eventually got offered a position as a Gym Leader for his phenomenal track record in the field and his specialty with water type pokemon. He took his post in _ City, and has just begun serving his country in a much different capacity. Neptune is taller than most and extremely solidly built. His muscles are honed from years of active combat service, and he works out regularly in addition to the insane amount of time that he spends in the water on a daily basis. 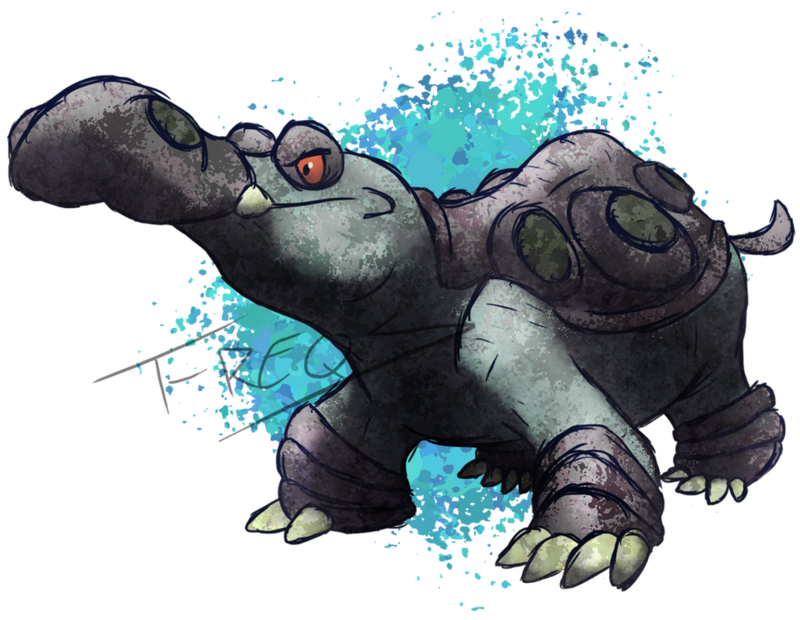 His intimidating height and build are complimented by his eyes (one yellow, one blue), and old knife scar across his nose, and the tattoo of a sharpedo silhouette on his shoulder. Next to his pokeballs, a serrated knife sits on his hip as a carryover from his Navy days, even though he rarely uses it during battle. Neptune is an extremely pragmatic individual. He knows what he wants, and he'll do what he needs to in order to get it. However, he also has an extremely passionate side. He loves the ocean, and the water is just as much his home as land is. Very in control of himself at all times, his military training has resulted in an intense monitoring of his responses, and he feels most comfortable when controlling the situation. His calm facade is enough to intimidate most people, and shows of emotion aren't his style unless they serve a purpose. He holds Calondros and the League in the highest regard, and is willing to fight in their honor, killing as many of the filthy Shalmos traitors as he could. While he takes pride in his fighting style and putting down rebels, he refuses to kill in cold blood, citing that his fighting style is meant (on ground at least) as a tool to subdue, not to kill. More at home in water than on land, if Neptune can get an enemy into the water, they are almost certainly in store for a difficult fight. Neptune's gym is a rather sprawling affair. It is built out of the skeleton of a retired navy ship, the SS Sharpedo. The upper levels provide battle arenas for trainers to use at their leisure, several competition sized pools, and weight training facilities for those of a more athletic bent. In order for any trainer to challenge Neptune, they must first earn the approval of his Gym Trainers, which are comprised of more Navy retirees. They weed out those who aren't ready for the challenge and ensure that Neptune isn't swamped with challenges. In rare cases (such as when Neptune is off on assignment for the League) his First Mate, a woman by the name of Kari, is allowed to run the gym in his stead. Additionally, any trainer seeking to challenge Neptune must pass a swim test if they wish to personally participate in the challenge. The challenge itself is rather different. Instead of a normal battle, trainers are taken down to the bowels of the ship, which is flooded with water. Neptune has constructed a variety of platforms, ladders, and flotation devices that allow challengers to maneuver awkwardly if they would rather not swim. Before the challenge, every participant (6 pokemon and, potentially, the human challenger) is given a rebreather as a safety feature, which they need not equip and can activate as a free action. They are told that if any member of their team uses a rebreather, the challenge is over and they have lost. The challenge itself is a rather one sided capture the flag, where the team has 5 minutes to retrieve a flag from the bottom of the ship (under quite a bit of water) and return it to a designated location. Of course Neptune and his team love to interfere, dragging opponents underwater, throwing them off platforms, and doing whatever they can to prevent the opposing team from reaching the flag. Challengers may also challenge in groups, where up to 8 trainers or pokemon may challenge at a time (he prefers 4 trainers and 4 pokemon but will work with any combination). In this style of challenge, he doesn't command his pokemon, instead letting them fight on their own while he devotes himself completely to the task at hand. The Gym's signature move is wrap, one final testament to Neptune's unique fighting style. Vital Throw EOT N/A Fighting DB 7; 2d6+24 Melee, 1 Target, Push, Reaction If the user is targeted by a Melee attack and has not yet taken a turn this round, the user may declare Vital Throw. After the triggering attack is resolved, the user may use Vital Throw against the triggering foe as a Reaction. Vital Throw cannot miss. The target is pushed 6 meters. Endure Daily N/A Normal N/A Self If the user is hit by a damaging Move, you may use Endure as a Free Action. If the Move would bring Endure’s user down to 0 Hit Points or less, Endure’s user instead is set to 1 Hit Point. Circle Throw At Will 4 Fighting DB 6; 2d6+20 Melee, 1 Target, Push The target is Pushed 6 meters minus their Weight Class. On 15+, the target is also Tripped. Mega Punch At Will 4 Normal DB 8; 2d8+24 Melee, 1 Target None. Rock Smash At Will 2 Fighting DB 4; 1d8+18 Melee, 1 Target Rock Smash lowers the target’s Defense 1 Combat Stage on 17+. Static While you are adjacent to an opponent, allies using Melee attacks against that opponent receive a +2 bonus to Accuracy Checks. Flippers 1 Flippers grant a +2 bonus to your Swim speed when fully submerged, and decrease your Movement speed otherwise by the same amount. Black Sludge 5 When held by Pokémon or Trainers that are not Poison-Typed, the Black Sludge causes that holder to lose Hit Points at the beginning of each turn as if they were Poisoned. Poison-Type Pokémon may consume the Black Sludge as a Free Action at any time; once they do, as long as the holder keeps the Black Sludge in their possession, they recover 1/8th of their Max Hit Points at the beginning of each turn for the rest of the encounter. The item is then destroyed. Body 5, Mind -1, Spirit 1. Effect: The target gains the Water Type as an additional Type, or has one of their Types replaced by that Type. This Feature may be performed One Time for each Rank above Untrained you have of Tech Education, up to a maximum of 4 times at Master Rank. Effect: You perform this Grapple attempt as a Shift Action. Effect: Soldiers gain the ability to train themselves to hone their skills. After 1 hour of training themselves, a Soldier may choose a Stat besides HP; that Stat becomes Trained until an Extended Rest is taken. The default State of Trained Stats is +1 Combat Stages instead of 0. A Soldier may have only one Trained Stat at a time. Effect: Until the beginning of your next turn, the target gains a +2 Bonus to Accuracy Checks made with Struggle Attacks and a +2 Bonus to Combat Skill Checks made to make or resist Combat Maneuvers. Effect: You also deal damage as if you had hit the target with a Struggle Attack in addition to any effects from the maneuver. Effect: You gain the Teamwork ability. Target: Your Pokémon with at least 2 Tutor Points. Effect: The Target Pokémon loses 2 Tutor Points, and gains your choice of the Teamwork or Discipline Abilities. You may target a Pokémon with PokéSoldier only one time. Effect: You may give yourself two Trained Stats instead of one. Effect: You gain the Gilled Capability and +2 to your Swim speed. Effect: Water Moves have their DB increased by 1. Target: Your Pokémon with at least 1 Tutor Point. of your Chosen Type, and may have different effects. A Pokémon may have only one Move-Sync’d Move in their Move List at a time; to Sync a new Move, the old Move must be forgotten. Effect: On Even-Numbered rolls, the target is pushed 1 Meter. On a roll of 19+, the target becomes Blinded until the end of their next turn. 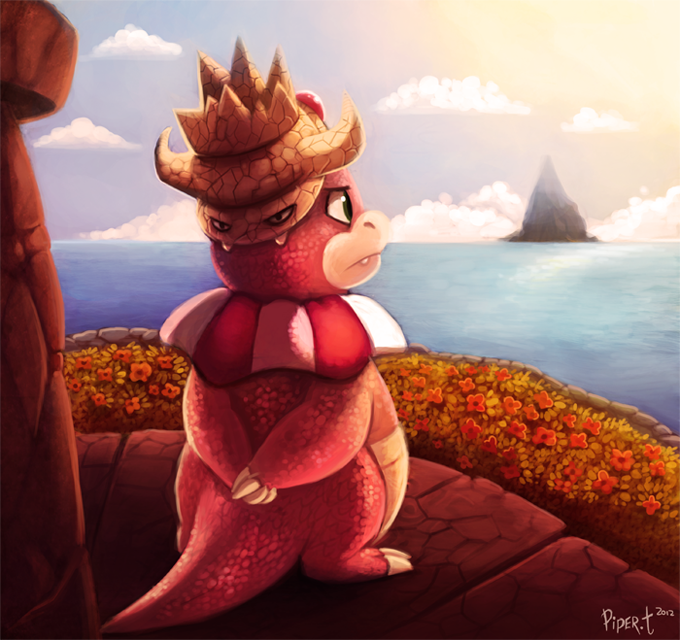 Admiral - Slowking, befriended during his youth. Admiral is the brains of Neptune's team, smarter in some ways even than Neptune himself. The leader's most trusted companion has keen interests in strategy, naval warfare, and cartography. Almost all of Neptune's best battle strategies came from this cunning Slowking. Several years ago Neptune dubbed him Admiral for being the commander that he never had the talent to be. Riptide - Poliwrath, gifted as an egg from his parents Riptide is Neptune's longtime friend and companion. An avid diver and fearsome soldier, Riptide takes pride in his abilities as a soldier, and he perfectly synergies with his master during battle. 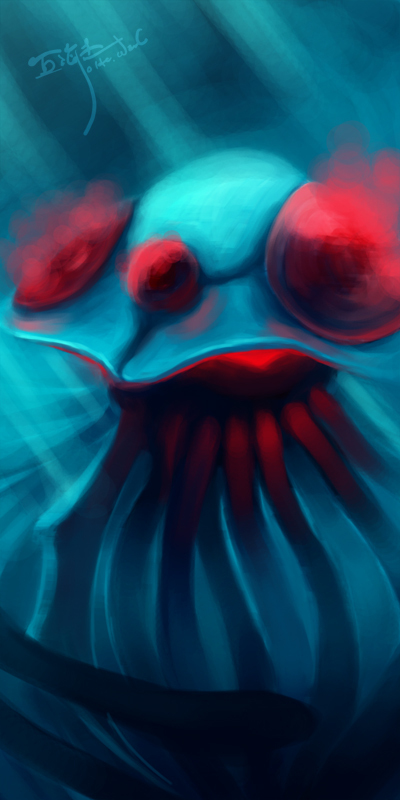 Leviathan - Tentacruel, captured in the ocean during Neptune's first year in the navy Enjoying a daily diet of Finneon, Leviathan enjoys his daily feasts greatly. It severely dislikes leaving the water, and will rarely do so. Instead, it enjoys dragging unwary enemies near the water into its environment with its long tentacles. Behemoth - Water/Steel Steelix, Captured near hometown Behemoth is big. Very, very big. Large enough to fit five on its back as a pseudo-submarine, Behemoth is one of Neptune's oldest pokemon. The two have been together since his days romping around on beaches, and Behemoth is extremely loyal. Battle is Behemoth's great joy, and he takes pleasure especially in ramming holes in enemy ships. 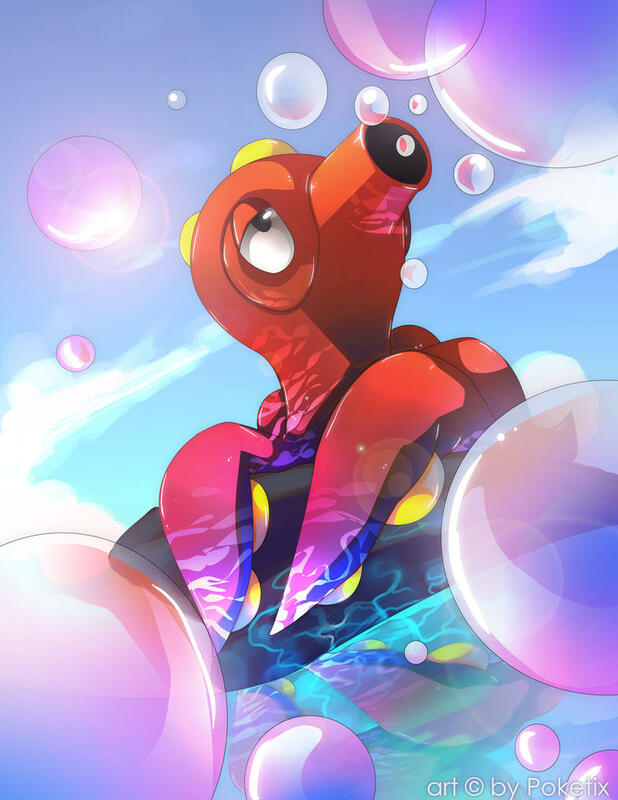 Cove - Octillery, Captured at Porttown Cove is the craftiest of Neptune's pokemon. It enjoys riding on its master's shoulder, tubular mouth aiming shots carefully. A master sniper, Cove's ranged combat skills are second to none on the team. Charybdis - Water/Ground Hippowdon, Captured near hometown. Charybdis is Neptune's simplest pokemon. She likes swimming, she likes biting things, and that's about it. Static Self The user is immune to his allies' AOE attacks. Daily x2 Self When the user is recalled or takes a breather, the user gains Hit Points equal to 1/3rd of its maximum Hit Points. Regenerator may be activated only once per Scene. Scene x2 N/A Normal Status N/A Blessing Any user affected by Safeguard may activate it when receiving a Status Ailment to instead not gain that Status Ailment. Safeguard may be activated 3 times, and then disappears. EOT 4 Normal Status N/A 6, 1 Target The target’s Attack is raised 2 Combat Stages. Swagger Confuses the target. Scene x2 N/A Electric Status N/A 6, 1 Target Thunder Wave cannot miss. Thunder Wave Paralyzes the target. Targets immune to Electric Attacks are immune to Thunder Wave’s effects. Daily x2 N/A Psychic Status N/A Field Starting at the beginning of the next round, for 5 rounds, the area is considered Rewinding. While Rewinding, Initiative is reversed, and participants instead go from lowest Initiative to Highest. Scene N/A Psychic Status N/A Blessing Blessing – Any user affected by Light Screen may activate it when receiving Special Damage to resist the Damage one step. Light Screen may be activated 3 times, and then disappears. Daily x2 N/A Psychic Status N/A 6, 1 Target, Aura Restores 50% of the target’s max Hit Points. Heal Pulse’s user may not target itself with Heal Pulse. Static Self The user is immune to the damage and effects of Water-Type attacks, and whenever they are hit with a Water Type attack, they gain Hit Points equal to 1/10th of their Max Hit Points. Static Self While suffering from Burn, Poison, Paralysis, Freezing, or while Asleep, the user’s Attack is raised 2 Combat Stages. If suffering from none of these conditions, the user loses any Combat Stages gained this way. Static Self Connection - Hypnosis. When used by the user, Hypnosis cannot miss. Static Self While you are adjacent to an opponent, allies using Melee attacks against that opponent receive a +2 bonus to Accuracy Checks. At Will 9 Fighting Physical DB 12; 3d12+35 Dynamic Punch Confuses the target. Dynamic Punch ignores the target’s Evasion if they are Flanked. Scene N/A Normal Status N/A Self The user gains +6 Attack Combat Stages, and loses Hit Points equal to ½ of their Max Hit Points. At Will 2 Ice Physical DB 8; 2d8+35 Melee, 1 Target Ice Punch Freezes the target on 19+ during Accuracy Check. Scene x2 2 Ground Physical DB 10; 3d8+35 Burst 3, Groundsource Earthquake can hit targets that are underground, including those using the Move Dig. Scene x2 N/A Psychic Status N/A 4, 1 Target The target falls asleep. Hypnosis cannot miss. Static Self The user may not lose combat stages. Daily Self If the user is allowed to spend time fully submerged in water for at least 10 minutes, they may heal up to 25% of their Max Hit Points, and remove one Injury. Static Self Attacks that target the user have a -2 Accuracy Penalty against the user. Does not affect attackers with the Blindsense Capability. Static N/A Normal Static N/A N/A The user gains a +2 Bonus to Accuracy Checks to Struggle Attacks made to initiate Grapple Maneuvers, and +1 to Skill Checks made to initiate Grapple Maneuvers. Whenever the user ends their turn and is grappling a target, that target loses 1/10th of their Max Hit Points. All effects stack with Bind and Clamp. Static N/A Normal Static N/A N/A The user gains a +1 Bonus to Accuracy Checks to Struggle Attacks made to initiate Grapple Maneuvers, and +2 to Skill Checks made to initiate Grapple Maneuvers. Whenever the user ends their turn and is grappling a target, that target loses 1/10th of their Max Hit Points. All effects stack with Wrap and Clamp. Scene N/A Water Status N/A Self, Coat Aqua Ring covers the user in a Coat that heals the user at the beginning of their turn. The user is healed 1/10th of their maximum Hit Points each turn. Scene x2 2 Poison Special DB 12; 3d12+25 See Effect, Full Action The user shifts up to 5 meters in a straight line, attacking all targets along the path. The user may stop at any point; when they do, they create a Burst 1. You may not a specific target more than once per use of Sludge Wave. Scene x2 2 Grass Special DB 8; 2d8+25 6, 1 Target After the target takes damage, the user gains Hit Points equal to half of the damage they dealt to the target. Static Self The Pokémon is immune to the Moves Sheer Cold, Guillotine, Horn Drill and Fissure. If any attack would lower this Pokémon to 0 Hit Points or less from full Hit Points, instead the Pokémon’s Hit Point value is set to 1. This effect fails if the user’s full Hit Point value is 1. Pokémon with Sturdy do not gain Injuries from Massive Damage. Scene, Swift Action A pokemon or trainer within 5 meters Lower the target’s Speed 2 Combat Stages. Static Self The user ignores the Recoil keyword when attacking. Static N/A Water Static N/A N/A The user gains a +2 Bonus to Accuracy Checks to Struggle Attacks made to initiate Grapple Maneuvers, and +2 to Skill Checks made to initiate Grapple Maneuvers. Whenever the user ends their turn and is grappling a target, that target loses 1/10th of their Max Hit Points. All effects stack with Bind and Wrap. EOT 5 Normal Physical DB 9; 2d10+33 Melee, 1 Target, Rush The target and the user are both Tripped on 15+ on 18+ the user is not Tripped.+. Scene x2 2 Steel Physical DB 8; 2d8+33 6, 1 Target The target reveals their Speed Stat (including Combat Stages). If it is higher than the user’s (again, including Combat Stages), subtract the user’s Speed Stat from the target’s, and apply the difference as Bonus Damage. Static Self When the Pokémon gets a Critical Hit, add the value of the Damage Dice Roll an additional time to the total damage. Static Self The Effect Range and Critical Hit Range of the user’s Ranged, 1-Target Moves are increased by 3. Scene - Free Action Self Connection – Lock On. By activating this Ability, the target may use Lock-On as a Swift Action. At Will N/A Normal Status N/A 10, 1 Target The target is Locked-On. The next Move that the user uses against the Target that requires an Accuracy Check cannot miss. At Will N/A Normal Status N/A Self The user becomes Pumped. While Pumped, the user’s Critical Range is extended by 3, or 17-20 if the Critical Range is not otherwise extended. Being switched will cause this effect to end. Scene x2 7 Electric Special DB 11; 3d10+53 12, 1 Target, Smite Thunder Paralyzes its target on 16+. If the target is in Sunny Weather, Thunder’s Accuracy Check is 11. If the target is in Rainy Weather, Thunder cannot miss. If the target is airborne as a result of Fly or Sky Drop, Thunder cannot miss. EOT 2 Bug Special DB 8; 2d8+53 6, 1 Target Signal Beam confuses the target on 16+. EOT 2 Fire Special DB 9; 2d10+53 4, 1 Target Flamethrower burns the target on 16+. Scene x2 2 Water Special DB 11; 3d10+53 5, 1 Target Scald Burns the target on 12+. EOT 2 Psychic Special DB 9; 2d10+53 5, 1 Target, Push The target is Pushed 1 meter in any direction. Psychic lowers the target’s Special Defense 1 Combat Stage on 14+. Scene, Swift Action Field The Weather changes to be Rainy. Static Self While Rainy, the user gains 1/16th of their Max Hit Points at the beginning of each of their turns. Static Self At the end of the User’s turn, if the weather is Rainy, the user is cured of one Status Condition. Scene x2 N/A Psychic Status N/A Self The user is set to their full Hit Point value. The user is cured of any Status ailments. Then, the user falls Asleep. The user cannot make Sleep Checks at the beginning of their turn. They are cured of the Sleep at the end of their turn in 2 rounds. EOT 2 Water Physical DB 11; 3d10+36 Melee, 1 Target Waterfall Flinches the target on 17+. Scene x2 4 Poison Status N/A 4, 1 Target The Target is Badly Poisoned. At Will 3 Fire Physical DB 7; 2d6+36 Melee, 1 Target Fire Fang Burns or Flinches on 18-19 during Accuracy Check; flip a coin to determine whether the foe gets Burned or Flinches. On 20 during Accuracy Check, the foe is Burned and Flinches. EOT 4 Rock Physical DB 10; 3d8+10 6, 1 Target Stone Edge is a Critical Hit on 17+.